As I've gotten older and played against stronger players I feel my game has become more traditional. Is this just me doing what I keep suggesting that my athletes do? Or does it have something to do with playing higher percentage points and patterns of play? Does the new scoring to 11 (well it's not so new anymore) greatly impact the importance of each point and make it less likely to play a few risky shots? Or perhaps it's that I don't train as much these days and I can't cover the court as well? It could also be that now my length is better so I feel that I can win points playing basic squash too. Anyways, for a variety of reasons things have changed, but I still have a passion for creative and chaotic squash. I'm always careful telling someone how to play. I do believe there are fundamental tactics that can be extremely effective. If I play basic squash better than some other player who plays the same way I am going to win that match pretty consistently unless they are way fitter than me; it's all playing the percentages and being a little more consistent will pay off over the course of a number of rallies. I've noticed that strong experienced players greatly prefer a rhythm to their rallies. Even when doing a basic drill like rotating drives or a length game if I play intentionally wild shots they are almost always more effective against a strong player than a well struck tight drive. Many top players only practice against other smiler skilled players who have the same process goal, hit it tighter on a more consistent basis. As soon as the angles and weight of shot are changed by a substantial margin they really struggle to adapt. Their movement, reaction and accuracy on the next shot will almost always be inaccurate. This is why we see the intentional shots down the middle from the front and occasionally from the back of the court these days. We also see some slightly heavier drops at the front of the court too as this is an area most top pros don't practice hitting from and moving into. Also, when you play a slightly heavier drop if your opponent counters straight they will not be in your path to the ball. These were just a couple of example of how pros use different types of shots which put their opponents in unfamiliar situations. At the top level all the players have tremendous basics as they've worked on that their entire squash career. But the ones that are the most exciting (Ramy Ashour!) to watch are the ones that also do things differently, dictate play and aren't afraid to mix things up and play riskier shots; they have a different vision on court than most os us do. Ramy has impeccable length, but is using it to set something up quickly while other players like Nick Matthew is more patient and using his attrition to wear down his opponents. I tell my students that there is always a best option of shot to play. This is important when learning to play squash as most amateurs will rarely select the best option (and often pick the absolute worst one!) which gets them in loads of trouble. We as coaches try and eliminate these shots from their game and for good reason, correct? Making good decisions is critical to becoming a consistent high level squash player. When you start playing against people that have played squash for decades they get used to playing certain patterns of play and there aren't too many surprises left in store for them. This is when each player settles in to see who has the best fundamentals or who can keep up the intensity of the rallies longest and over the course of 30-60 minutes we usually find out. These opponents will normally hit their best and 2nd best option throughout the entire match and it's easy to fall into patterns because of this level of predictability. Hit it deep from the back and front and look to attack on loose mid-court balls. There is little creativity and thinking going on when you play this kind of squash because it's ingrained and they are on autopilot; every decision and shot execution is done without really thinking because it's been rehearsed over and over and over. Don't get me wrong it can be done extremely effective if you want to spend a couple of hours every day for your entire career working on the same things over and over again and hoping to do them better than the next guy. I should also mention here that if you're a creative and attacking player, you still need to work on these basics day in, day out as well, but there is a lot more to squash if you want there to be. There is another alternative here and that is what I used in the title called 'chaos.' The degree of chaos you play will depend on your ability, open mindedness, opportunities and level of opponent. If I play people well below my level I can play zero traditional shots and they really struggle. This can be as simple as hitting non-traditional serves. Of course this level of opponent will struggle adapting to things they've never practiced against or seen before. The tricky part is when you play someone who is around the same level as you. If I attempt to play strange angles or my 2nd or 3rd or even 4th best option it could very well catch my opponent off guard, but it is also generally a riskier shot and lower percentage. This means if I play riskier shots I will make more mistakes and potentially set my opponent up for some quality openings. There is also more potential for a quick reward/opening, but there is also the threat that a high quality opponent won't let me get away with forcing the action and giving them an angle. 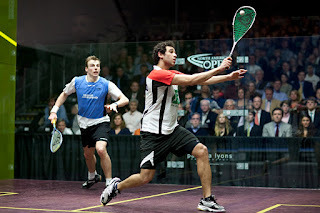 So it can be easy to fall back into the traditional style of squash against evenly matched opponents. Sometimes you need to play more basic in these situations and the longer you do the more your opponent is vulnerable to the quick attack or unusual angle. I like to think it's all about finding how much of what you can throw at someone and still be effective. I think there is a lot more room for chaos than we believe in our rallies. Chaos could be hitting shots right down the middle or at your opponent, varying speeds, angles and depths of shots, the spin, or using disguise and deception. You can hits shots that are unpredictable or even just change the timing of when you hit the ball. It's basically about not letting your opponent settle into that rhythm that they enjoy, practice and are searching for. Learning how and when to open up the court or hit an intentionally wild shot is what you need to learn and you can only really figure this out from experimenting in condition games and match play. I also have to mention that playing a chaos brand of squash can still be as methodical and well thought out as traditional squash. Just because you're not playing in a set rhythm doesn't mean there is a method to the madness; you simply see different types of openings than most basic squash players notice. If you play with chaos you are also looking to disrupt your opponents movement patterns and split step. It's a rather simple for a skilled player tome into and out of any of the corners and keep a ball straight that is already close to the sidewall. This becomes much tougher when the ball is jamming them and angled away from the sidewall. When the ball is moving at an angle towards or away from your opponent it will be very difficult for them to get the spacing and timing just right to hit their target and that's exactly what you're trying to do here. If they slightly miss your target you get that opening that your opponent is trying to set up with their basic length game. I believe it comes down to what style suits your game and what style you want to play. If you want to play traditional squash it is easier to teach and you can play it all the way to the highest level. If you are a creative person and that's what you enjoy I would encourage you to focus on this style of play. If I withheld someone from trying intentionally wild and creative shots until they were already a polished player I think it would be too late to change and they would have missed out of a lot of learning over the years. If you want to add some chaos to your game you need to always test out shots and be able to accept some mistakes in the short term. It will be tough to play full on chaos unless you have absolutely ridiculous shots and speed to cover your shots or your opponent is quite a bit weaker than you. Your court coverage and anticipation skills play a big part in your ability to play this style of play. Some people that don't move well are forced to try and end rallies quickly and will often go for outright winners from low percentage situations. This isn't really about playing chaos as it is being desperate and forcing the play. The heavily fatigued, skilled player will generally have the chaos to traditional squash balance way off which can get them into a lot of trouble, but occasionally can also cause great difficulty for some people because there is no traditional pattern of play. Personally, when I feel like playing creative and super attacking squash it's all about trying to push the envelope as far as I can and then going a little further. If I go a little over the line I'll get punished against a quality player and I know I am just a fraction over where I can be effective. The stronger my forearm and the quicker I get to the ball the more options I have. This is just how I liked to play, but I never fully committed to playing this style because I always wanted to win each and every match I played and often this means grinding it out and not making unforced errors. It's even tougher to stick to this chaos tactic when you're representing a team and your result effects the team as a whole. A good example of playing not the best option is deciding when to play an attacking two-wall boast from the back of the court. Unless your opponent is hanging way back or not watching you this will always be a riskier play than a straight drive, yet we see this shot played all of the time with a high degree of success at the pro level. Deciding when and how frequently to play this boast is the key. If your setup looks like a drive you will more likely have success with the shot. But if you play a boast every rally your opponent will expect it and will begin to pick them up even if they're well executed. So learning how many drives you need to play before using that boast is a key component to its success. You can begin to overthink this too, like your opponent will never expect a 2nd boast right after you just played one. This is where you are playing the least likely shot, but potentially the riskiest. I think to do this well is a gift and is something that is learned implicitly from your experience of years and years of chaotic squash. So which style do you play? How has it evolved over the years? How do you think the game will evolve over the decades to come? I believe it will become faster, more attacking and creative. The tin was lowered some years ago and the scoring has changed a couple of times already. The ball has also become slower because we hit the ball harder. When I was a kid we used the Merco single yellow dot and eventually this transitioned to the Dunlop single yellow. So if you're a junior and you have your sights on playing professionally one day this is something you should consider when you're training and developing your tactics and game plan. As a coach I feel I have an obligation to focus on helping kids learn the fundamentals, but I also want to be certain I allow for creativity and mistakes. It's difficult to find the right balance when kids are just getting started. How you teach them and the drills you run at practices will have a big impact on the type of player your athletes become. If you want to be a more traditional player you'll likely do lots of blocked repetitive drills such as rotating drives and boast drive whereas the open, creative chaotic players will do more conditions games and drills with options. And remember that even if you want to be a chaotic player you still need to do the basics well so make sure you can hit your targets on all the different shots or you'll never get the time and space you need to use your creative shot making ability. There's nothing quite like winning a point on a sneaky or risky shot. For some reason it just feels better, like it should be worth more than 1 point when we execute something ridiculously difficult or extremely intelligent and against the grain of common sense. What usually happens next for most people is they go right back to the well and either make a mistake or get burned. Finding the balance of chaos that works for your game and pushing the envelope is what you should be thinking about. I know a lot coaches will say there is only 1 way to play squash, but I completely disagree. I'm not suggesting that you completely change your style of play, but I bet there are some areas where you could play some sneaky unexpected high percentage shots and wins some easy points. If you really want to play with angles and be completely unpredictable the sky is the limit, but this again is a tricky thing to teach and learn. You'll need to be confident, commit to your shots, understand the swing/anticipation/deception, fearless, have unbelievable racquet skills and of course extremely creative. Some people don't like risk-taking and uncertainty and prefer doing things by the book. If you're a very traditional player that plays high percentage and smart squash I guess you will struggle against chaos because this will be much different than how you practice. Remember chaos works because people aren't used to the patterns of play and the angles they constantly have to deal with. There's more than 1 way to play all the different shots and the goal is to make your opponent miss their targets and become unsettled. That's it for today, thanks for reading! Please check out my new online squash gear store at SeriousSquashShop.com I've designed performance enhancing squash gear including shirts that say 'If You Can Read This I'm Winning' on the back of them which should help you volley more and focus on dominating the T. Plus a variety of sport psychology wristbands that have essential positive statements on them which will allow you to train harder, refocus and play smarter in competition. I would love to see what you recommend as being your 1st, 2nd, 3rd, and 4th best options when taking the ball at each corner, and both mid court volleys.